Now that the hustle and bustle of the Christmas season is done and we are starting a new year many of us can get back into our sewing rooms. I know mine is a mess from all the sewing I did for family and friends. So let's start sewing again. This is a tutorial that I found on HGTV.com on Prairie Points. 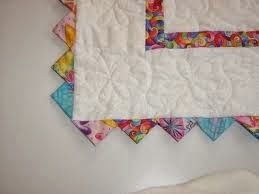 To determine the initial size of your points, consider the proportion of your quilt. Audition points of various sizes to determine what looks best. For the pictured project, one block in the quilt was measured, and that length was divided into about 3½ prairie points. 1. Fold a selected fabric square into a half-square triangle, right sides out. 2. Fold the square again into a quarter-square triangle and press. Once folded, the raw edge will be the same length as the initial square. 1. With right sides together and raw edges aligned, place prairie points along one side of the quilt top. When satisfied with the placement and all points are pinned down, continue in the same manner around the rest of the quilt top. 2. Sew the prairie points with a ¼-inch seam. 3. Layer, baste and quilt the quilt top. Stop quilting about ½-inch from the edge. 4. 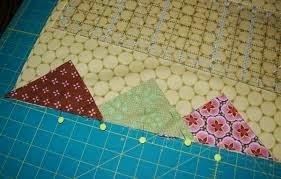 Trim the backing ¼-inch beyond the raw edges of the quilt top and prairie points. Carefully trim only the batting slightly less than the raw edges of the quilt top and prairie points. 5. Turn the prairie points away from the center of the quilt. Note that the seam allowance turns inward. Wrap the backing over the edge of the batting. Secure the backing to the prairie points with pins, and hand-stitch to close. Easy peasy. Actually I have made these before and they are pretty easy to do once you get the hang of them.